When today's K-12 students enter college and embark in their careers, they will most likely encounter a wide array of game-like elements, such as badge systems. In June, Blackboard Learn, a learning management system for higher education, announced a partnership with Mozilla to support digital badges. In the corporate world, badge systems are also used to increase employee productivity. 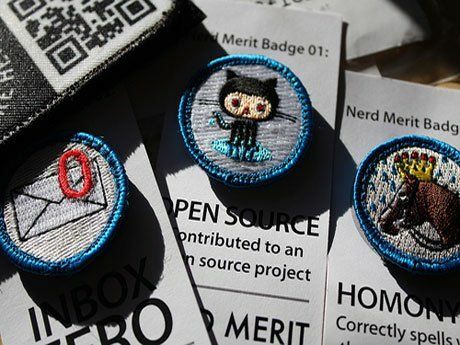 Mozilla's Open Badges Backpack serves as a virtual resume to display one's mastered skills. One of the main goals of the Common Core State Standards (CCSS) is to prepare students for "college- and career-ready performance." According to CoreStandards.org, "English language arts and math were the subjects chosen for the Common Core State Standards because they are areas upon which students build skill sets which are used in other subjects." Badges can acknowledge the learning that has occurred along the way. Game-based learning (GBL), like the CCSS, places a strong emphasis on mastering skills. In a gamified classroom, students start at the "newbie" level, and then build skills and "level up" to become masters. The "boss level" is when students apply all of the skills mastered to overcome a difficult task. GBL does not necessarily mean that students are simply playing video games in school. A variety of non-digital games, including boards, cards or dice, can "gamify" learning as well. Problem-based learning (PBL) and challenge-based learning (CBL) units can be gamified by adding game mechanics, such as rules, missions and leaderboards. PBL and CBL lend themselves well to gamification because they present students with authentic tasks to perform using accumulated skill-sets. Teachers can also "mod," or modify, pre-existing games to fit skills and content. CCSS skill mastery can be acknowledged with a digital badging system. Badge accumulation can occur in a non-linear fashion; some students may earn different badges than others. This strategy, known as embedded assessments, is common in gamified classrooms. Embedded assessments are built into the overall learning experience. A teacher can award CCSS badges during a gamified unit rather than at the end. In this respect, badges can support differentiated learning. For instance, a student may earn a badge at any time for meeting CCSS.ELA-Literacy.SL.7.4: "Present claims and findings, emphasizing salient points in a focused, coherent manner with pertinent descriptions, facts, details, and examples; use appropriate eye contact, adequate volume, and clear pronunciation." The CCSS only guide English language arts and math teaching. Other disciplines, such as science and social studies, should "anchor" or support the Standards. In social studies, a student can earn a badge for meeting CCSS.ELA-Literacy.RH.6-8.9, when he or she can "analyze the relationship between a primary and secondary source on the same topic." Similarly, science teachers can recognize students who meet CCSS.ELA-Literacy.RST.9-10.10 by reading and comprehending "science/technical texts in the grades 9-10 text complexity band independently and proficiently." In order to maximize student engagement, a teacher can add a hidden challenge, known as an "Easter egg." Easter eggs empower the student to test the boundaries of the learning system. For instance, a student may solve a secret riddle in a lesson and, in the process, meet CCSS.Math.Content.HSS-MD.B.5a: "Find the expected payoff for a game of chance." In a badge system, there are three interconnected participants: the issuer, the earner and the displayer. In the classroom, as opposed to a video game, the teacher is the issuer and the student is the earner. There are many options for badge displayers, including Youtopia, ForAllBadges, ClassBadges and Edmodo. Many of these sites let teachers create virtual classrooms and also provide predesigned artwork. You can download this PDF for a helpful, side-by-side, badge-displayer comparison chart. Badges recognize the achievements that produce intrinsic satisfaction. Basically, when a student enjoys a task, learning feels less like work and more like fun. Intrinsic motivation differs from the extrinsic goals that are traditionally associated with school (grades) and with work (paychecks). According to Cathy Davidson, badges "recognize competencies, skills, training, collaborative abilities, character, personal contribution, participatory energy, leadership and motivational skills, and other so-called 'hard' and 'soft' individual and cooperative talents." The teacher's role is to scaffold knowledge and skills as the student progresses through the content. The difficulty for acquiring Common Core badges should increase, or level up, as skills build up. The boss level badge represents mastery of a Core Content skill. Students who earn boss level badges should perform well on CCSS benchmarks and state tests, such as the PARCC Assessment and the Smarter Balanced Assessment Consortium (SBAC). A Common Core badge system can also bring fun to the process of learning and mastering new skills.